Oy! On a beautiful day that I would love to be spending in my backyard contemplating my little garden construction project that has become my obsession (contemplate, not do actual work on it -- but look for a photo soon to show where I am at with it) I am about to leave for the Portelos hearing -- where I hear the slimy investigators will testify. I know Portelos did talk to them and no matter how innocent you think you are they will twist any word out of place and use it against you. This should be a good lesson for all of us to pass on about how to deal with OSI. My instinct is to refuse to say anything. Let them gather evidence -- you will have your day at the hearing. Of course people talk to them hoping they will hear your side and there won't be a hearing. Looking at the evidence, they are not interested in your side -- the interview is to catch you. But maybe I am wrong -- check with lawyers. As I've been reporting, we are not telling details -- you can check the charges at Protect Portelos -- but so far all I hear is nonsense from the DOE -- without much to go on they are trying to paint Portelos as a terrorist -- someone to fear -- like the principal and staff are afraid of him -- taking some of the words of anger he used when he came under attack out of context. The DOE lawyer was already whining that some are intimidated by him and won't testify against him. As NYSUT lawyer Chris Callegy said -- "If I had a nickel for every person intimidated by the DOE...."
I expect other retiree MOREistas to attend. STOP THE CHARTER SCHOOL INVASION THREATENING DISTR... I have to leave the hearing about 4:30 to get to the 5:30 rally at Seth Low at 99 Ave. P (near West 9th St in Brooklyn) where Eva is invading. Say what? This is white Bensonhurst. The border of District 20 and 21. A charter there? Well you know the Eva drill. Poor kids of color are passe. She need to build her political machine in all parts of the city to fuel her mayoral ambitions. There is a hearing at 6 and I will stay for a while. Click the link above for more info. (I will take some footage). But then I have to get over to PS 51 at 350 5th Ave in Park Slope for the CEC 15 sponsored High Stakes Testing forum where our pals Leonie Haimson, Jia Lee and Fred Smith will be on the same panel with Shael Polokow-Suransky. I will tape if I can. I don't expect to get home until 10PM or later. And I will be very hungry. Can someone email me a chicken parm hero? Help counter the massive Unity machine. Can't make it? Donate anyway. Parent Calls for Support of Oct. 9 "Win Back Wednesday"
Janine Sopp issues a call to her network. There are links to the Toolkit prepared by MORE for use in your schools, plus a great video prepared by MORE Media. The day will culminate with a rally outside the UFT Delegate Assembly (52 Broadway) on Oct. 9 at 4PM with a focus on the evaluation system the UFT leadership is pushing. If only the usual suspects are there they will be ignored. I know people -internally and externally who are critics of MORE for not coming up with an alternative system of evaluation. That is an issue for further discussion, though frankly, given there is no real way to judge a teacher's work through the use of data, maybe what we had (S or U - maybe add a middle rating like I) was the best way -- though I would create an independent investigative unit to take a close look at abusive principals who target certain people for political or economic reasons. In Ravitch's "Reign of Error" she points to a question asked of many foreign educators: "What do you do about a bad teacher? Answer: We help them. Q: And if they are not improving? A: We help them some more. And if that doesn't work we help them find another profession." Actually, if they are basically competent in some ways but can't seem to manage the classroom situation, there must be some position in the ed structure for them. As most of you know, we are facing a new year in our children's schools where standardized tests will have even higher stakes attached to them. Because NYS has created a teacher evaluation system that is tied to the tests our children are mandated to take, we expect an even higher level of stress throughout the year. With the implementation of the Common Core Standards and the creation of new tests that have not been fully aligned yet, and are often poorly designed, our kids will be used somewhat as guinea pigs, but the stakes are too high for this kind of experimentation. Even our youngest students, in K-2, will be subjected to these measures and we will see the quality of teaching deteriorate under these circumstances. If you find all of this troubling and feel you have no power over what is happening, you are wrong. Now more than ever, parents are taking charge of their children's educational destiny and saying NO. At a time when we are choosing a new mayor to lead our schools in a new direction, we actually have more influence than we may realize. We have the power to vote, we have the right to opt out, we have a voice that needs to be heard and many organizations with which to organize. Whether you are a parent, a teacher, an administrator, a student or a concerned citizen, you can show your support by joining others who are actively working toward shifting the conversation and the direction of education, the runaway train that needs us to step on the brakes. Attached is an incredible tool kit, created to help your schools organize for a day of action to kick off "Win Back Wednesdays" on October 9. Please share this tool kit with your school leaders, PTA, SLT, PAC, your families, teachers and administration. There are ideas for actions, small and large, to support the empowerment of our students and our schools. Know that there is a state wide movement to end the use of high stakes standardized testing and it's punitive effects. Adding your voice, your action, will help grow the movement to make the shift to a more balanced, holistic approach to our children's education and give our children the schools they deserve. Feel free to post photos of your actions to Change the Stakes and MORE Facebook pages. Check out and share this Win Back Wednesday video. Want to learn more, come to Brooklyn for one or both of these events. Having Kozol review Ravitch is like getting the gold ring. Which means someone at the NY Times Book Review has some sense. The NY Post has a Michelle Rhee clone do the review. I imagine there are different forces at work within the Times and I expect we will see a different type of review when the daily Arts section, usually Janet Maslin, review the book. In the school wars I am reminded of The Terminator where robots are out to stamp out humans. There is no middle ground. Resist or be wiped out. So I find it amusing to hear calls for both sides to lay down their arms -- as if the real reform humans are on equal footing with the ed deform robots with all the power, money and weapons. There is no middle ground and articles like this one in The Atlantic written by a charter school teacher ends lining up with the robot deformers ("can't we support "good" charters like KIPP?)". There was a recent article in the same magazine (I can't find the link right now) comparing books by Rhee and Ravitch -- as if it is conceivable there can be a middle ground between them. We have a better chance of finding middle ground with Korea. Or Iran. 396 pp. Alfred A. Knopf. $27.95. Over the past 20 years, a rising tide of voices in the world of public policy has been telling us that public education has fallen into an abyss of mediocrity. Our schools are “broken,” the mantra goes. Principals and teachers — their lack of “rigor” and “low expectations” for their students — are the primary offenders. The problem can be “fixed” only if schools are held to strict accountability. “No excuses” are to be permitted. The pressure intensified in 2002 with the enactment of the federal testing law No Child Left Behind, which mandated high-stakes standardized exams that were supposed to bring every child to “proficiency” by the year 2014. When it grew apparent that this goal would not be reached, privatizing leaders pounced, offering business-modeled interventions as, perhaps, the only viable solution. Prominent figures in financial circles and at large foundations became interested in charter schools, encouraged their expansion and provided grant support to some of them. Others, with less philanthropic motives, saw a market opportunity and started running charter schools for profit. What had been a slowly growing movement now became a juggernaut. Diane Ravitch was for many years one of the strongest advocates for the testing-and-accountability agenda. Because of her impeccable credentials as a scholar and historian of education, she was a commanding presence among critics of our schools. Some years ago, however, she reconsidered her long-held beliefs and, in an influential book, “The Death and Life of the Great American School System,” parted ways with her former allies and joined the highly vocal opposition. In her new book, “Reign of Error,” she arrows in more directly, and polemically, on the privatization movement, which she calls a “hoax” and a “danger” that has fed on the myth that schools are failing. Scores go up and down from year to year — usually, as she explains, because the testing instruments are changed and vary in their difficulty. But, pointing to the National Assessment of Education Progress, which has sampled math and reading scores every two years since 1992 and, in an alternate version, every four years since the early 1970s, Ravitch demonstrates that levels of achievement have been rising, incrementally but steadily, from one decade to the next. And — surprise! — those scores are now “at their highest point ever recorded.” Graduation rates are also at their highest level, with more young people entering college than at any time before. Black and Hispanic children, nonetheless, continue to lag behind. The black-white gap, as Ravitch documents, narrowed greatly in the era of desegregation, but progress has slowed as the hyper-segregation of our schools and neighborhoods along both racial and economic lines has come to be accepted once again as the normal order of the day. Market competition has not reduced the gap. Charter schools — Ravitch says we ought to ban those that operate for profit — have an uneven record. They “run the gamut from excellent to awful” and, on average, do no better than their public counterparts. Those that claim impressive gains are often openly or subtly selective in the children they enroll. Most do not serve children with severe disabilities. Others are known to counsel out or expel problematic students whose performance might depress the scores. All of this, she says, has continued unrelentingly under the administration of President Obama, who has given “full-throated Democratic endorsement” to “the longstanding Republican agenda.” The president’s signature education package, Race to the Top, is “only marginally different from No Child Left Behind.” In fact, it compounds the damage by requiring that states evaluate teachers, partially at least, on the basis of yearly gains in students’ scores — no matter if the teacher has a different group of children from year to year, which is usually the case, and no matter whether a teacher has more troubled children, or more with disabilities, than another teacher who comes up with higher scores. Ravitch has her own ideas about how to elevate the quality of education. Among her proposals: vastly expanded prekindergarten programs introducing children to “the joyful pursuit of play and learning”; more comprehensive medical and mental-health provisions (“every school should have a nurse, a psychologist, a guidance counselor”); smaller classes (like those in costly private schools); and diagnostic testing that, unlike a standardized exam, shows us where a child needs specific help — but, because it’s not judgmental, casts no cloud of anxiety over learning. In the long run, she puts her faith in teachers but wants to strengthen the profession with higher entry standards. We can’t rely on “enthusiastic amateurs” who teach short term, any more than we’d rely on amateur physicians. She rejects stick-and-carrot incentives like merit pay — “the idea that never works and never dies,” and that undermines the spirit of collaboration by pitting teacher against teacher. She also deplores humiliating practices like publishing teachers’ names beside students’ test scores, as has been done in California and New York. If we are to cast about for international comparisons, Ravitch urges us — this is not a new suggestion but is, I think, a useful one — to take a good, hard look at Finland, which operates one of the most successful education systems in the world. Teachers there, after competing for admission to schools of education and then receiving a superb course of instruction, are “held in high regard” and “exercise broad autonomy.” They are not judged by students’ test scores, because “there are no scores.” The country has no charter schools and no “Teach for Finland.” But, as Ravitch reminds us, there is one other, crucial difference: “Less than 5 percent of children in Finland are growing up in poverty.” In the United States, 23 percent do. In her zeal to deconstruct that narrative, Ravitch takes on almost all the well-known private-sector leaders and political officials — among them Arne Duncan, Joel Klein, Bill Gates, Wendy Kopp and Michelle Rhee — who have given their encouragement, or barrels of their money, to the privatizing drive. It isn’t likely they’ll be sending her bouquets. Those, on the other hand, who have grown increasingly alarmed at seeing public education bartered off piece by piece, and seeing schools and teachers thrown into a state of siege, will be grateful for this cri de coeur — a fearless book, a manifesto and a call to battle. Join MOREistas in Win Back Wednesday: Our Children are MORE than a Score! And here is another excellent video from the MORE Media Team. So, amongst all the inherent faults of the Common Bore, we have the totally inept Walcott-led Tweedies showing once again that they would find getting out of a paper bag a significant challenge. - NONE of the Common Core materials are written in Spanish, making it impossible to teach literacy according to the dual language or bilingual model. Thus there were classes full of students, some of them just arrived to the country, and others with IEPs, who were struggling with materials that they had NO chance of being able to read. Add to this that the grade level of some of these Pearson texts are already way above the grades assigned them, even for fluent English speakers (see Clara Hemphill on this), for example, Charlotte’s web in 2nd grade; and an informational text on spiders for 4th grade, full of VERY difficult vocabulary and densely packed prose that I had difficulty getting through. This is a perfect example of how the Common Core’s standardization model and difficulty level seem totally misguided – especially for ELL students and kids with IEPs, who have also assigned these materials. My son's school started using a a "common-core-aligned" math series this year. I'm not sure whether or not there is a Spanish edition, but there is definitely not an English edition :-). Pardon the sidetrack, but the definition of "core aligned" (based on my limited sample) seems to be "random quotes and references to sections of the common core standards sprinkled throughout the the text, with no discernible connection to the pages on which they appear." 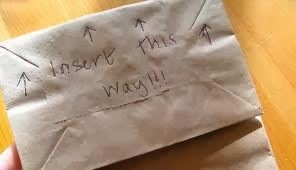 If what I've seen is in any way representative, common core is nakedly nothing more than an excuse to sell the same old books in a new wrapper. 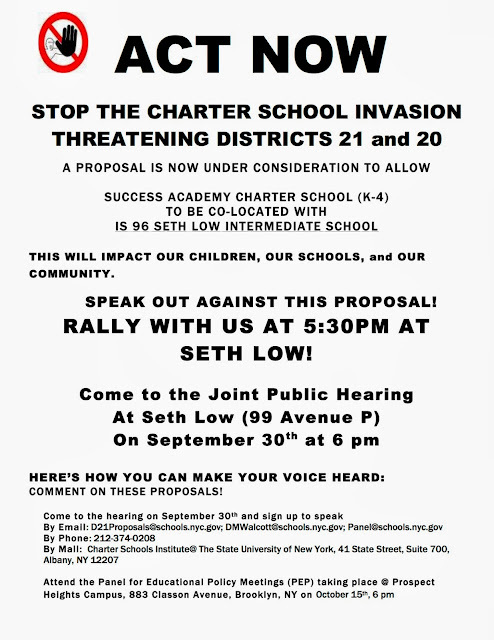 Rally at Seth Low (99 Ave. P in Brooklyn) Monday, Sept. 30 at 5:30 before the 6 PM meeting. They're coming. Charter and co-loco invasions are coming to every nook and cranny of the public school system, even those who thought they were exempt from the carnage. But people are fighting back. Many of us have been through this drill time and again, always with the same result. But with Bloomberg Tweedies soon to be vacating the premises there is some hope. A strong community demonstration just might have an impact. Or it might not, but now is the time to go for it. Monday I will be at Round 3 of the Portelos hearing -- I may leave early to get over to Seth Low for the rally and the early part of the hearing before heading over to the CEC 15 High Stakes Testing meeting at PS 51 which will feature Leonie Haimson and MORE/Change the Stakes Jia Lee and Fred Smith on Panel HST Panel with Shael Polokow-Suransky, who people are guessing may be an interim Chancellor when the skunks dessert the mother ship. Shael tries to appear reasonable and parent friendly. Don't believe it. Here's the text of the leaflet if you want to share.